Andre von Hoyer, Vice Chairman, Michael Allen, Michael Churchill, Andy Motel, and Michael Richter. Bill Westhafer and Wendy Leland were absent. Mrs. Csete told Mr. von Hoyer that a replacement pole is on order for the pedestrian pole located near Whitehorse Road and Morehall Road that was damaged by a truck. The installation estimate will include the cost of purchasing and installing the new decorative pole, or an option to relocate it so it does not get broken again. PennDOT approval will be needed to relocate the pole. Mr. Dan Walker of the EAC was present to introduce himself. The EAC is compiling comments to forward to pipeline representatives. Mr. Allen was told the rocks in the playfield at Spring Oak will be removed. Mr. Churchill moved to approve the minutes of June 12, 2018 with one minor edit, and Mr. Motel seconded. Mr. von Hoyer called for discussion, and there being none, called the vote. All were in favor. 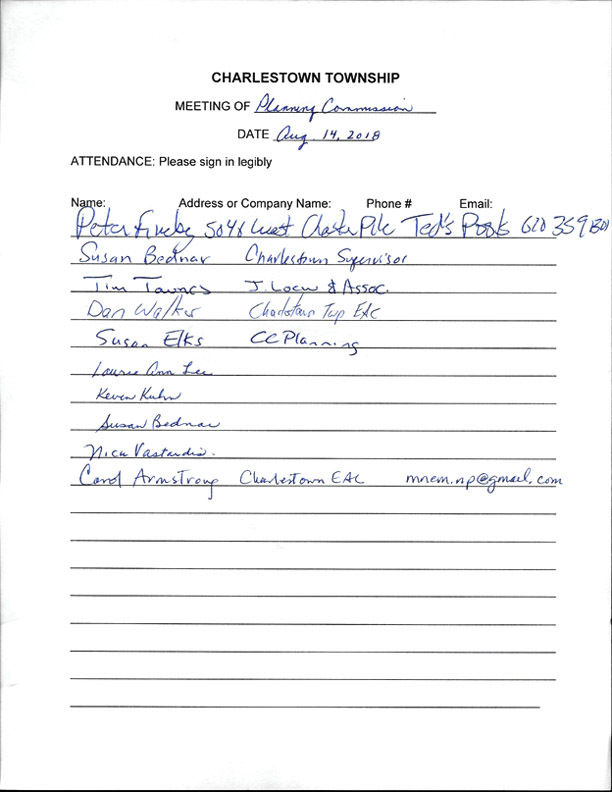 There was no July meeting. Ms. Susan Elks, Planning Services Division Director of the Chester County Planning Commission, provided an update on the County Comprehensive Plan, entitled Landscapes3. Her hand-out, dated August 14, 2018, described the County’s progress on strong growth plans, demographics, open space, and transportation. This version differs from Landscapes versions 1 and 2 in that it is reorganized into six topics to guide municipalities on growth and preservation, as well as county government actions, and addresses issues that transcend local municipal boundaries. Preserve: Advance the protection and stewardship of open space, farmland, and natural and cultural features, to realize economic, ecological, and quality of life benefits. Protect: Protect and restore critical natural resources to ensure a resilient environment that supports healthy communities. Appreciate: Preserve the historic resources and landscapes that define our cultural heritage to inspire the future through tangible connections to our shared past. Live: Nurture diverse and well-rounded communities with a balance of residential opportunities and convenient access to community facilities, services, and amenities. Prosper: Grow our economic strength through developing and sustaining a skilled workforce, adaptable work areas, supportive infrastructure, a culture of innovation, and engaged communities. Connect: Advance efficient, reliable, and innovative transportation, utility, and communications infrastructure systems that responsibly serve thriving and growing communities. Mr. Comitta stated that Charlestown, and himself, appreciates the degree of detail the County uses when performing reviews for Land Development. Suggestion: Revise the Charlestown Village Historical District on the map entitled Historical Landscapes. Mr. Churchill referred to the projected 146,000 additional County residents, and asked what the County is doing to help municipalities not succumb to suburban sprawl, and what funding, if any, was being provided? Ms. Elks did not foresee any additional funding in the near future but stated that the 146,000 projection fits within the growth of already established urban and suburban centers. People are consuming less acreage than before. Boroughs are growing so that the rural areas are not in danger of sprawl. Suggestion: To proactively assist municipalities such as Charlestown, that have been classified as primarily rural, in maintaining that status, by including that language within Landscapes3. Mr. Motel discussed municipal cooperation. He mentioned that the County has always been supportive of projects that cross the boundaries of townships, and involve townships working together. Suggestion: Identify multi-municipal intersections, corridors, and trails, etc., thus establishing a foundation supporting the collaboration of neighboring townships that might work together. Mr. Richter had a question regarding the Connect portion of the presentation since much of the traffic is moving over state owned roads. Mr. Richter asked where and how does the County get state recognition for the need of traffic flow improvements? Ms. Elks stated that the Delaware Valley Regional Planning Commission (DVRPC) will receive Landscapes 3, and it also goes to regional authorities like PennDOT. Landscapes 3 information tells the State where the funding needs to go. The state authorities always look to the municipalities to see if they have taken all possible actions. Mr. Allen asked how the County measured up in comparison to Landscapes 1 and 2? Ms. Elks stated that the sprawl was less than expected. Plus, there is plenty of information on this at the County website. Ms. Elks said the next steps were a public meeting October 2, a public hearing on November 29, then a request for municipal endorsement in 2019. Construct a pool with a deck in Steep Slope. Construct an infiltration bed in an area of Steep Slope. Install a boulder wall, steps, steppers, and a pool equipment pad. The relocation of an existing stormwater pit to the lawn. The property slopes to the back so the water sheet flows to the forest toward a distant neighbor. The current plan shows easements and a previously relocated Horseshoe Trail. The stepping stones to the shed will be in Very Steep Slope. There will be orange fencing around the Very Steep Slope so that it isn’t accessible. There is a 20-foot setback. A positive response was received from closest neighbor, plus there is a thick buffering line of trees. Next, the applicant must present the project at a Conditional Use Hearing before the Board of Supervisors and demonstrate that the proposed improvements are consistent with the Conditional Use Standards in Section 27-1809 of the Zoning Ordinance. She was instructed to bring updated plans to the September 4th, 2018 hearing. Mr. Motel moved to recommend the Conditional Use Application, subject to compliance with the review letters of Thomas Comitta Associates, Inc. dated July 12, 2018 and Advanced GeoServices dated July 12, 2018. Mr. Richter seconded. Mr. von Hoyer called for discussion, and there being none, called the vote. All were in favor. Mr. Tim Townes of J. Loew & Associates, Inc. was present for a review of a preliminary/final land development plan, last revised June 5. 2018, for expanded parking at the Village at General Warren. Tonight’s plan portrayed a re-working of the east area of the site, with an entrance eliminated. The proposed additional 74 parking spots would be located behind the west leg of the shopping center, although Mr. Townes admitted they were still hoping for more than 80. The shopping center is still 45% empty, with some restrictions on the types of future tenants such as, it may not have a competitor of PJ Whelihan’s. Many options for staying under the 60% maximum impervious coverage were discussed. The presentation was met with Mr. von Hoyer reminding Mr. Townes that the potential for a lack of parking was discussed before final approval, and that Mr. Townes had measures in place if this problem arose. Use of the rain garden area would allow the creation of 48 stalls. Using the berm area on General Warren Blvd. Borrowing land across the street. Parking across the street was discussed since the TND is designed to be walkable. Current plans have cars further exposed due to deciduous plantings. The hotel has customers with reservations that can not get parking. There was no one present from the Marriott. They require 120 spots, currently there are 285. The worst parking problem is after work from fall to spring. Zoning relief will be needed if Mr. Townes can’t make the correction contiguous. Tonight’s drawing had 74 more stalls, of which the lower 18 were discussed at length. Mr. Townes will return after researching parking across the street, the berm, and stormwater management. He also will bring depictions from different viewpoints next time he is on the agenda. The Planning Commission continued its review of the draft Phoenixville Regional Comprehensive Plan, which will also serve as the Charlestown Township Comprehensive Plan. The PRPC is reviewing part of the 10 chapters each month in preparation for their public meeting introducing the Plan in August. Tonight, Mr. Comitta told Members that he thought these chapters for the most part, were thorough and well written. His main comment was to consider replacing the first paragraph on page 1 of the Housing Plan, with a “101” type narrative that summarizes Section 301. (a)(2.1) of the PA MPC. There was a brief discussion about the need to increase the riparian buffer for Charlestown. In some instances, the current buffer is 100 feet, while the DEP is recommending 150 feet. Mr. Comitta stated that he will forward this comment along with other minor edits (in an email dated August 9, 2018) to Ms. Leland. She will then take them to the PRPC. Mr. Allen provided an update on the final approval process for the Devault Village at Spring Oak Design Manual. Mr. Allen, along with Ms. Carol Quigley of Frens & Frens, and Supervisor Susan Bednar, will consider the best way to address the four house sizes for Devault Village and return to the Board of Supervisors. Mr. Allen, giving credit to Mrs. Bednar for mentioning this, stated that the home sizes noted in the permit drawings do not necessarily reflect what is seen from the street. (This has massing and architectural aesthetic implications.) Many permitted drawings reflect the finished living space and not the actual constructed space, which may include unfinished spaces (example bonus rooms). Mr. Allen discussed footprints being the size of the basement, with another level above being the formula they are considering (as the box). The Township will hold the builder to smaller sized homes too, as in the Spring Oak manual. Mr. Churchill, in the name of all Members, thanked Mr. Allen for his work with the DRC. Mr. Richter told Mrs. Csete that he believed there was a directional sign for the Park at Coldstream Road and Charlestown Road that needed better placement. There being no further business, Mr. von Hoyer adjourned the meeting at 9:38 p.m.